After a brief taste of summertime with temperatures exceeding record highs in the Central PA region things have returned to normal and seasonal weather that could soon include frosty conditions. So if you rushed to set out crops like tomatoes and peppers, just be prepared for some anxious mornings after nights spent covering frost sensitive plants. I’ll play it safe and won’t even be slightly tempted to plant out tomatoes, peppers, and eggplants for at least another month yet. But that definitely doesn’t mean that the veggie garden is bare right now, in fact I’ve been harvesting produce since the first days of March when those fall planted leafy greens began sending up delicious new growth! Generally the term “hunger gap” referred to the period in late winter and early spring when root crops and other stored foods were running low but the next season’s harvest had not yet begun. Before the days of grocery stores it was a critical period, and one where any plants offering a new harvest would be valued. Those over wintered leafy greens are perfect picks to fill that hunger gap period and supply fresh produce from the end of winter until spring planted crops come into production. And there are also crops like leeks, sunroots, parsnips and salsify that were left in the ground throughout winter to harvest later. 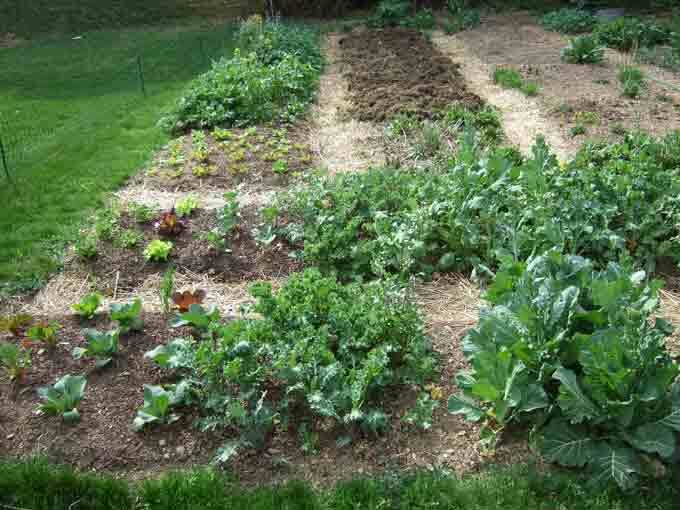 Yet more reasons why growing a fall vegetable garden is so rewarding. It’s also another reason why it is a great idea to become familiar with some of the wild edible plants as many of them begin to dot the landscape long before gardeners plant their first seeds into the ground. There is already plenty of dandelion, chickweed and garlic mustard scattered around my backyard and early spring is the best time to enjoy these wild greens. You can also find many perennial herbs that have broken their hibernation and started growing again. Angelica, mints, tarragon, oregano, horseradish, comfrey, sage, lovage, and others have all produced significant growth at this point in the season. Look closer and you can even spot annuals like epazote and calendula that have reseeded themselves and are just now germinating and becoming visible. Venture further out and you can go foraging for fruits of the forest. Ramps, fiddleheads, and an assortment of wild morels and mushrooms are available if you know when and where to go looking for them. If this is new territory for you look around for a local workshop, class, or expert to share the knowledge and satisfaction of foraging free food from the forest’s garden. Back in the home garden spring plantings are well underway with transplants having been set out for the following; cabbage, broccoli, leeks, spinach, Chinese cabbage, lettuce, and Swiss Chard. All of which can easily handle frost without stressing the gardener or requiring extra work in the form of protecting the plants. In the perennial edible bed the blackberries have been pruned and are looking great, new strawberry plants have been set out, and I’m doing my best to resist harvesting any of the unusual purple asparagus shoots from plants that went in last spring and aren’t intended to be harvested for the first time until next spring. Finally the fall planted garlic and potato onions are growing happily and look very promising for the summer’s harvest. In the meantime they can both supply some spring onion-like greens and even baby garlic for the kitchen. I also found some shallot seed bulbs at a local nursery, planted them a week or so ago, and noticed that they have sprouted already. 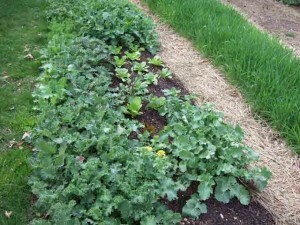 So the garden is off to a great start and I hope you can recognize that with the right mix of knowledge, incentive, and a home garden it is very easy to supply your family with a taste of fresh produce right through the lean periods of the garden’s “hunger gap” during late winter and early spring! We are just new gardeners, even though we are in our 50s. It just took us that long to get a home where we have the yard space. We have had record high temperatures here in New Brunswick Canada this year and we were out doing lots of yard work, just beautiful. It’s hard not to want to start planting something in our new vegetable garden, but instead we are going to spend our time increasing the size of our garden. We started vegetable gardening last year, 2009, with a 4 x 16 foot plot and now we are going to triple the size. That should take me a while and maybe I won’t be tempted to plant early. Last year we had a lot of vegetables but they didn’t last even into the winter. 🙂 This year we hope to be able to can some vegetables to use over the winter. When we bought this home we own now we did so because it came with two lots, so now we have one lot that over time will grow into one big city garden. We all know that the real homeowners dream is a lush, green perfect lawn that requires almost no work to maintain and that is cheap to grow. The simplest solution to this problem that fills all the required needs is to grown an organic lawn. I was just wondering how your experiment went with the tomato wire. I watched the video & was wondering if you have another video of the tomatoes after they grew up through your wire & if you were happy with the result. I will make a decision to try this myself this year based on what you tell me. PS. I do not see my purple asparagus popping up yet. I think I should be seeing soemthing by now. Do you see yours? Hi Stacey, the tomato trellising with the wire worked out great and I talked about if a bit in this post about last summer’s tomato blight. Yes, my asparagus has been up for weeks already. Some of the plants were a little slow in making an appearance but I would expect that you would have seen some signs by now. 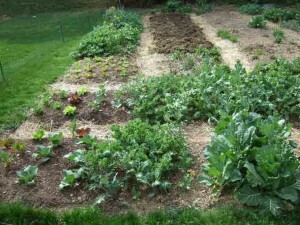 Next post: Raised Bed Vegetable Gardening; Easy Does It!